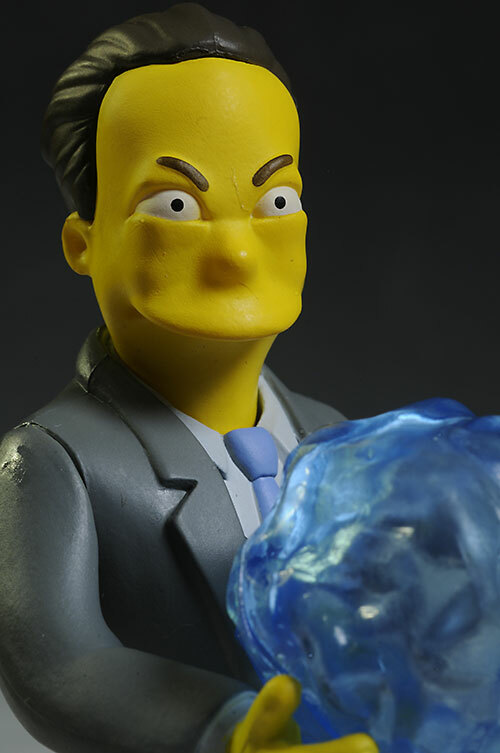 NECA has already released its third - and announced the fourth - series of action figures based on the many celebrities on the show. This third wave includes the three members of R.E.M., Stephen King, Leonard Nimoy, Bret Hart, a Milhouse variant, and the four I'm reviewing tonight - Penn, Teller, GITD Mr. Burns, and a Lisa variant. Don't worry, I'll get to the other 7, but it's going to take a couple more reviews. These are showing up now at online retailers as well as your local Toys R Us. Expect to pay around $12 - $13 each. The only thing that this packaging isn't is collector friendly. Yep, it's traditional card back and bubble, and you'll have to destroy it to free the figure. But the cards look great, and they have a ton of personalization on the back including a bio and synopsis of the episode that each figure is from. Add in photos of the entire wave - all 11 - and screen captures from the episode in question, and you have about everything you could ask for in mass market packaging. And there's only one twist tie! I've got no complaints with these four. 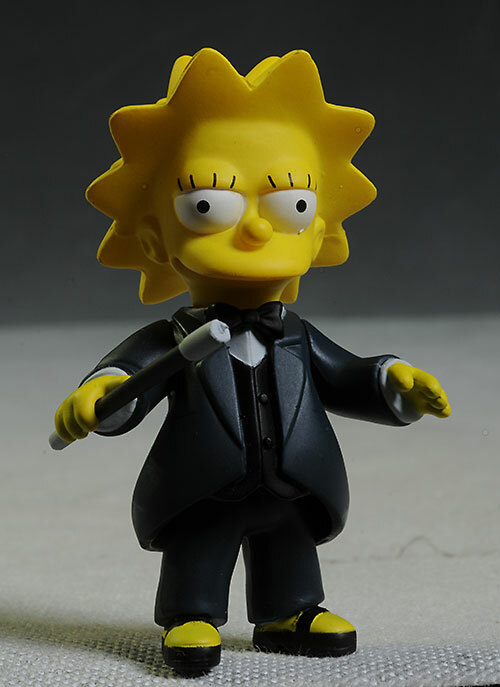 While Lisa is merely a variant, she's a well done variant, and one that fits in perfectly with the Penn and Teller figures. 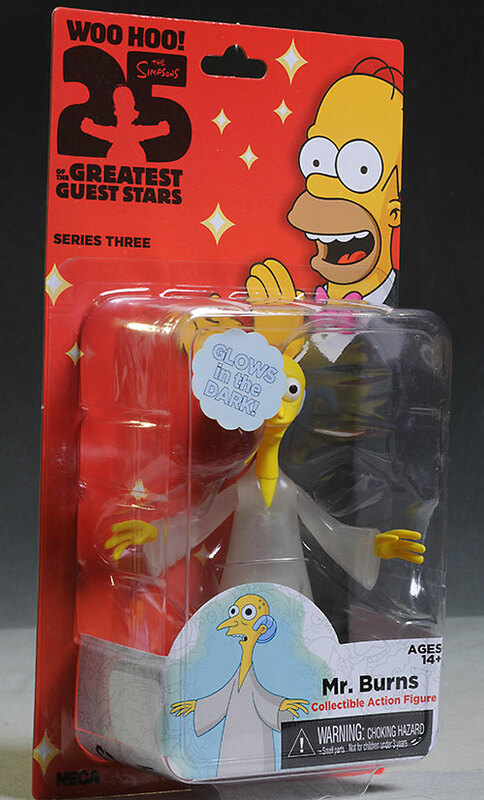 All three are from the same episode - "The Great Simpsonia" - which makes them the perfect trio on the shelf. Which brings me to Penn and Teller, both looking great. Penn has the more obvious look of course, but paired together, they're fantastic. Both of the magicians are done in fairly dynamic poses, something that's a bit unusual for the old World of Springfield line, but is a welcome departure. It fits in with their appearance on the show as well. Penn is tall, as he is in real life, coming in at 5 1/2" in a crouched position. Little Lisa is on the opposite end, topping out at just over 3" tall. 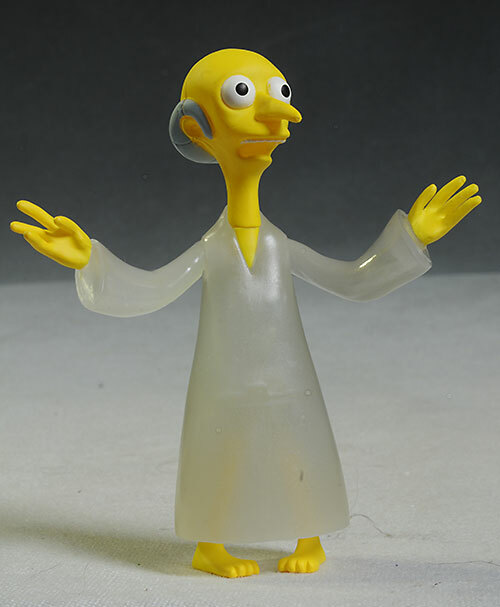 Finally, there's Mr. Burns. This ghostly appearance is from "The Springfield Files", when Scully and Mulder showed up to help with a paranormal sighting. They haven't announced a Scully and Mulder yet - please, oh please do - but the Nimoy in this wave is also from this episode. 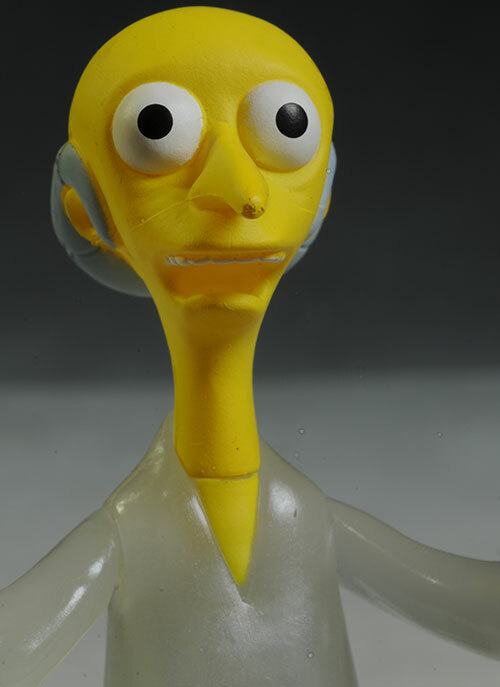 This figure has the wide open pupils and ethereal body shape specific to that episode. The greenish cloak he is wearing is made from glow in the dark plastic, so he can creep you out even more when the lights go out. All of them stand great on their own, although I did find Lisa a little more difficult than the others. You'll need to play around with her a bit to get the center of gravity just right with her tiny feet. There's a few blips and blops here and there, a sloppy edge, a smudged nose. The work is solid, especially considering the price point, but they can still improve the basic quality. These figures are not cast in the yellow, as the majority of the WoS figures were, making them a bit more susceptible to issues like rub marks and damage. 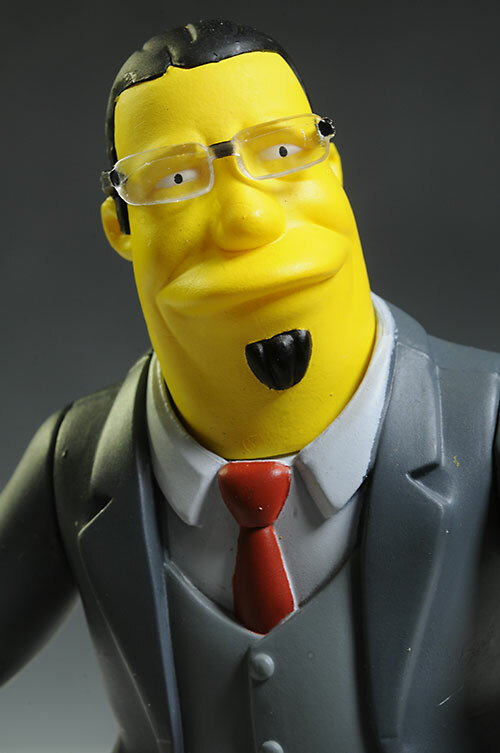 Still, the eyes are clean on every one, and I really like the small details, like the clear plastic lens on Penn's glasses, or the GITD quality with Mr. Burns. Speaking of which, it works quite well. You'll have to zap him with the light evenly to get the best effect, but it's worth it. It's basic stuff, but it works. There's neck, shoulders and waist - all simple cut joints. These are figures that could really use wrist cut joints as well, especially Penn and Lisa. Turning the wrists would give you some additional looks with the wands. Still, the basic articulation fits in well with the older series. The one area where the new series has lagged behind WoS is in this category.There was plenty of re-use back in the day, but there was always a healthy assortment of goodies with every figure. More often than not, the new figures have nothing with them. That's the case with Mr. Burns, although that makes sense. There really isn't any thing additional he could use, considering the nature of the appearance on the show. The money was better spent on the GITD feature. 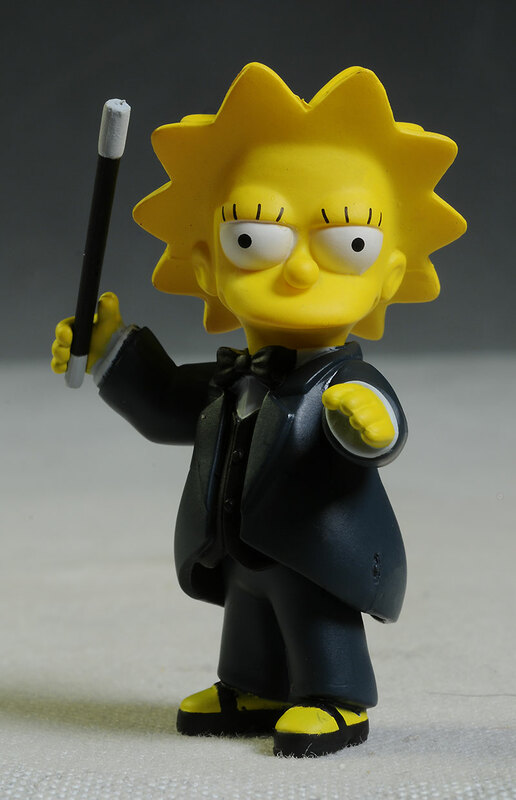 Penn and Lisa both come with a wand - a different wand. They fit perfectly in the sculpt hands, and look great. Teller has a large ball of energy, which can be placed neatly between his two hands, just like in the episode. It does tend to make him topple over, but if you get the lower legs in just the right spot he'll stand fine. These aren't super articulated, but they are still super fun. If you're a big Simpsons fan, they give you the chance to add to your World of Springfield display. If you're a fan of the celebrities themselves, you get a chance to own their Simpsonized version. Either way, it's a win! You aren't going to find a lot of action figures in this scale for this price. That's kinda sad, but it's also reality. 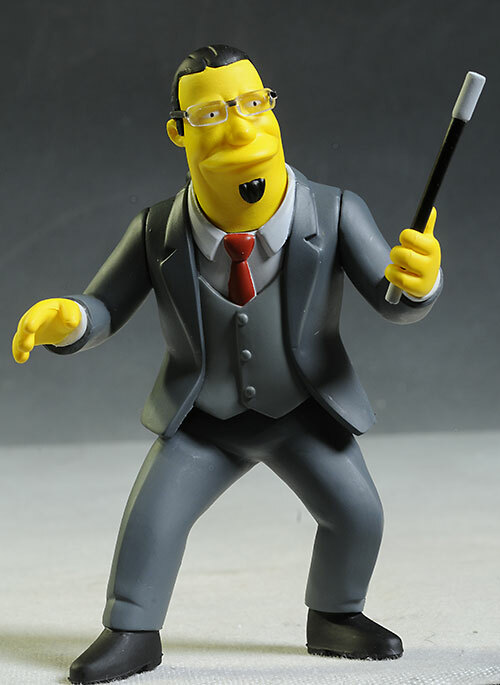 I can pine for the days of $5 WoS figures, but that won't make them come back. Compared to the majority of lines on the pegs, these are a very solid value, and I'm glad to see them a few bucks below average. When you have 11 figures in a wave, that really adds up! This wave has been a nerd dream, with characters like Penn and Teller (not to mention King and Nimoy - more on them soon!). While there are a few nits to pick, these four will all take a place on the shelf next to the best of WoS and hold their own. 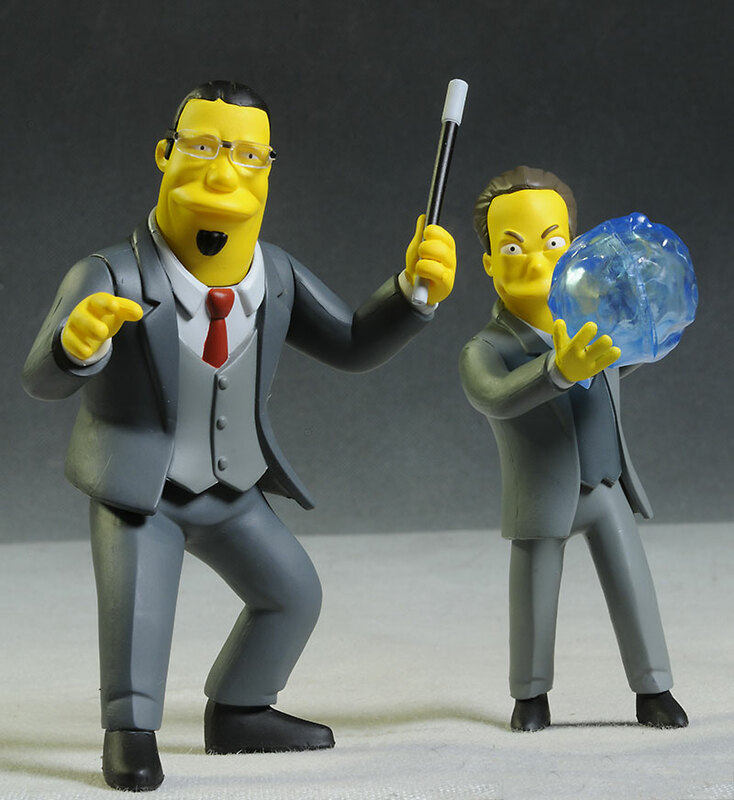 I particularly like Penn and Teller, but that's because I dig not just the figures, but the gentlemen themselves. They've already announced wave 4, which is a good sign. I'm hoping this line keeps going strong for several more waves, with a ton of celebrity potential still out there. - has eight of them (no Burns, Lisa or Milhouse) for $110, or the complete set of 11 for $140. - Entertainment Earth has a case for $252. I've covered all the new NECA figures so far, done usually in parts. Wave 2 was in part 1 and part 2, as well as first series in two parts, here and here. 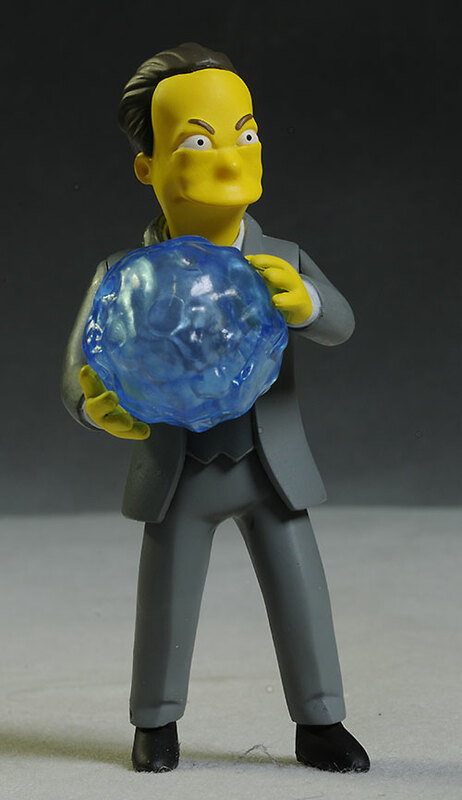 I've also looked at the new Simpsons Lego mini-figures in two parts, here and here. I have a full listing of my past Simpsons reviews here, as well as a long feature on the World of Springfield here.